It’s a time for relaxing when we slow down and sit around a pool, right? Not if you’re a serious entrepreneur. But yet that’s what a lot of entrepreneurs do... then they wonder why they’ll behind the ball come September. If you think you can just sit around this summer taking a “breather” from working on your business, you are not thinking clearly, my friend. Check out this video on how you can make this the best summer yet! Unless of course, you run an empire and have a team to do everything for you in which case, hats off. Go enjoy that month in Greece, you deserve it my friend. Listen, I’m not saying you can’t take a break or have fun... what I am saying is that you absolutely shouldn’t take a break from your growth just because the summer months are typically slow. Truth is, summer moves quickly and soon we’ll be smack in the middle of Q3 and Q4, statistically the busiest and most profitable times of the year for entrepreneurs everywhere. At least those who used their summer to plan out their steps. So stop playing around and get in front of the ball! I think summer is actually the PERFECT TIME to work on your business and yourself, to plan out the action steps you will take to be successful come fall and winter. When you do, you'll come out swinging! Ready to take action, hit your goals and make more money than ever before. How awesome does that feel? Summer is when I do some of my best work. Last year, I generated more than $60,000 between July and August. ...make more money in 30 days than the entire year before. ...have bulletproof confidence to launch their dream podcast. ...get more done in two weeks than the last 6 months. ...feel like a powerful rockstar who's destined for success. 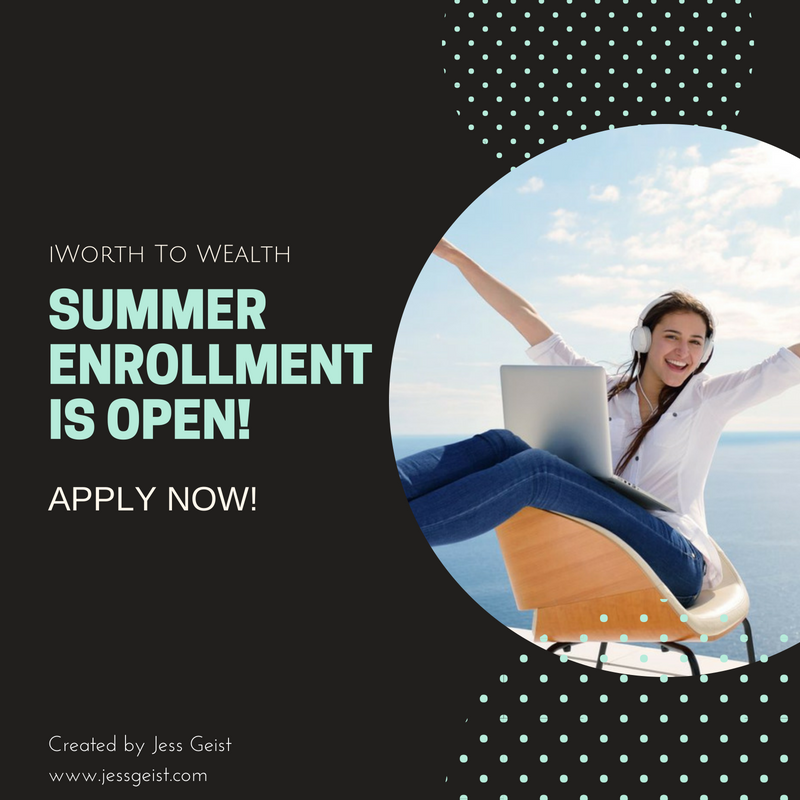 In fact, I’m starting this summer with another round of my awesome Worth to Wealth Program! Program isn't the right word, it’s more like a Massive Action Masterclass, because that’s what we’ll be doing in there..TOGETHER. Over 12 very action-packed weeks this summer, I’ll be rewiring the minds of committed entrepreneurs to turn them into fearless money making machines. I’m not messing around here. We combine the life-changing forces of hypnotherapy and coaching to install new "thoughtware" that overrides negative thoughts, feelings and behaviors so you can take massive action without thinking about it. By the end of this summer, you can crush your fears and leave them in the dirt. You will put yourself out there, you will take massive action, you will make more money, and you’ll love to do it, too. Your journey to success and happiness starts NOW. Worth to Wealth can help you get there. I'm guessing you read this far, then you're curious. Take a leap, fill out an application and schedule a strategy session with me to explore how you can rewire your mind to become a fearless money making machine! Maybe Worth to Wealth is what you've been looking for, but you will never know if you don't schedule a call and find out. Fill out an application and schedule a call now to discover how you can make this the best summer yet!